Successfully Added HD-Hyundal HDMI Karaoke Mixer - Dual Microphone Input, Echo Effect, Individual Volume Controls to your Shopping Cart. Invite the friends and family round for nights to remember as you show of your vocal talents. 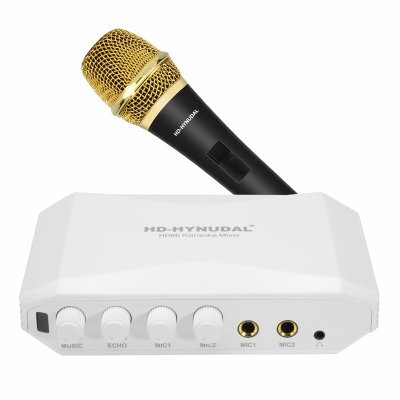 The perfect way to get your party on, the HD-Hynudal Karaoke mixer has audio output so you can make use of your home speakers and with the two microphone inputs you’ll be able to sing duets with your friends. Suitable for use with a wide range of Karaoke software such as Karafun, Sunfly, Mike crazy, MV box, K show and loads more there will be no shortage of hits for you to enjoy. The HD-Hynudal Karaoke mixer comes with a 12 months warranty, brought to you by the leader in electronic devices as well as wholesale home AV equipment, Chinavasion..